Journey to the castle in the sky to discover the riches of the sleeping giant! Click here to play! You don’t even need to be named Jack to do so; this exciting adventure will have you spinning up exciting combinations in no time at all. 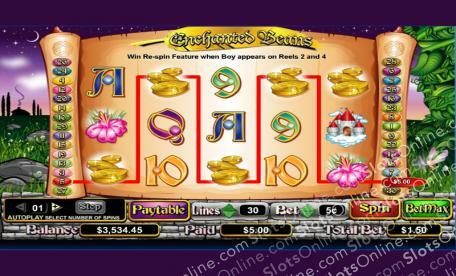 Enchanted Beans is a wonderful 5-reel slot that is played across 30 incredible pay lines, with the more lines activated allowing for more winning combos. The Boy can be substituted for any other symbol on the reels except Scatters and Re-spins. The Golden Axe is a Re-spin tool and, when it appears on Reel 3 between two Boys, the Re-spin feature is activated. The Scatter is a trio of Magic Beans, and can appear anywhere on the reels in order to earn a payout. If you land all five on the reels you will be rewarded with 100 times your initial stake. Adventure to the top of the world today, and return with an enchanted stash of cash! The Magic Beans are Scattered, pay out up to 100 coins, and can show up anywhere on the reels to earn a payout. The Boy is Wild and can be subbed into winning combos. In addition, if he lands on reels 2 and 4 while the Golden Axe lands on reel 3, the Re-spin feature will be activated.